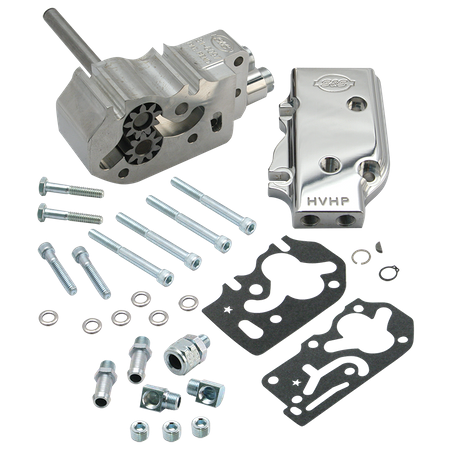 Polished billet oil pump kit with universal cover for 1984-'91 HD® big twins. High volume high pressure pump only kit includes supply gears, return gears, drive shaft, drive shaft keys, drive shaft snap rings, check ball, check ball spring, pressure valve, pressure valve spring, cover screws with o-rings, miscellaneous hose fittings, plugs, screws, paper gaskets, and mounting hardware. *Pinion shaft gears included in these kits fit stock 1984-’89 pinion shafts and S&S pinion shafts for 1984-’99. Will not fit stock 1990-’99 straight pinion shafts. Standard style covers have feed and return holes in the stock locations. The universal cover has a number of oil feed and return options, allowing maximum flexibility for customized applications.